In the South, the term “greens” refers to vegetables whose leaves are cooked until tender. During cool fall temperatures, mustard, turnip, collards and other greens flourish in the vegetable garden. And now is an excellent time to plant them. Greens are highly recommended for the home vegetable garden because they are easy to grow and very productive. Growing greens is a great way to keep your vegetable garden productive through winter. Mustard and turnips are fast-growing greens, and harvesting can begin as early as five or six weeks after planting. You can either harvest the entire plant or “crop” the plants by removing only the lower, larger leaves. Cropping provides harvest while allowing the plant to remain and continue to grow. It also allows you to extend the harvest. Generally, if the winter is mild, mustard and turnips planted now can be cropped until late winter or early spring. Cropping turnips will reduce the size of the root, so you may want to reserve a portion of your turnips for root production. On those plants, do not harvest any leaves. The leaves use photosynthesis to produce food that is transferred to the roots for storage. That storage root develops into nice-size turnips ready to harvest in eight or nine weeks. You can grow collards year-round, but the best quality comes during the cool season. A frost will “sweeten” collards and make the greens even tastier. Plant the seeds 2 inches apart, and then thin the plants as they grow to a spacing of 10 to 12 inches between plants. Properly spaced plants are best harvested by cropping the older, larger leaves. Collards tolerate high temperatures better that most greens. They are also very cold hardy and survive temperatures in the low 20s without damage. Spinach must have cool weather for best production, and fall plantings do especially well. A warm spell can often cause this vegetable to “bolt,” particularly in spring. Bolt is a term used when a leafy vegetable matures and produces a flower stalk. You want to prevent your spinach from bolting so it will produce leaves instead of flowers. Cool weather, adequate water and regular applications of nitrogen fertilizer will encourage the spinach to remain in vegetative growth cycle. Spinach is slow-growing for the first few weeks after it comes up. Be patient, and keep the plants well watered, and they will eventually grow large enough to harvest the entire plant or begin cropping. Swiss chard is an excellent substitute for spinach. It is easier to grow and more productive, and it tolerates warm weather much better than spinach. The chard leaves can easily grow 14 to 18 inches tall, so production is much greater than with spinach. Chard is available in several white-stemmed types. Red-stemmed types such as Vulcan and a variety called Bright Lights – which produces stems of white, rose, red, yellow gold or orange – are very ornamental and even look great in flower beds. When cooked, chard is similar in flavor to spinach, and young, tender chard leaves can be eaten raw. The leaf stems are delicious cooked separately and have a mild, almost asparagus-like flavor. Plant the seeds 2 to 4 inches apart and thin the plants to eventually stand 8 to 10 inches apart. Harvest chard by cropping. Kale is a close relative of collards and has a similar flavor when cooked. Kale is very cold hardy and can withstand temperatures into the teens. Space plants 10 to 12 inches apart. Redbor kale is a Louisiana Super Plant selection with beautiful frilly, burgundy-purple, edible foliage. Ornamental kale, with its brightly colored rose, pink or white central leaves, is a popular bedding plant and is also edible. Cabbage is another leafy vegetable that is suited to cool weather. You can find green and red cabbage varieties. The heads are ready to harvest when they become hard. Transplants planted now should be ready to harvest in late winter or early spring. Although not generally cooked, lettuce is often included in discussions of greens. Leaf and semi-heading lettuce varieties are easy to grow. 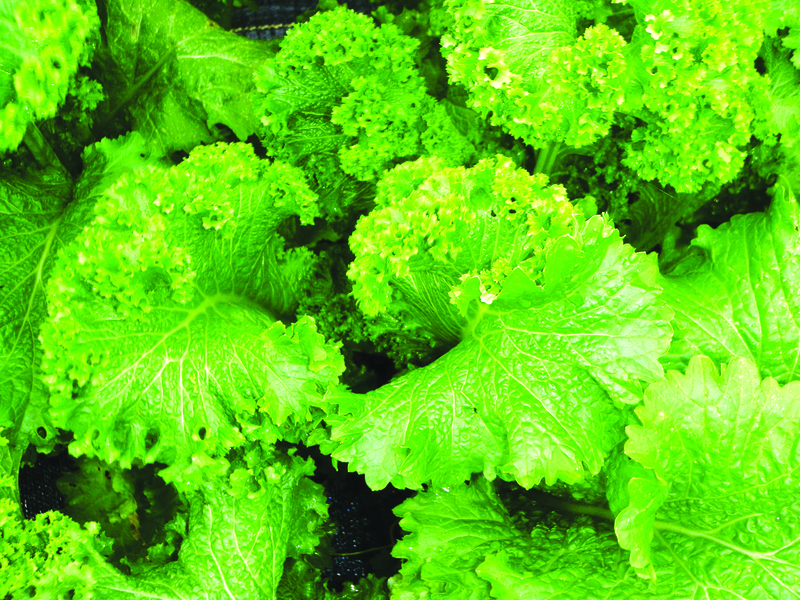 The heading lettuce varieties, such as Iceberg, are more of a challenge. Leaf or semi-heading types of lettuce to try include romaine, buttercrunch, bibb and oak leaf types, which are sure winners. These days, lettuces come in an amazing variety of colors, from deep green to chartreuse and from shades of pink to red to burgundy. The leaves may be smooth, ruffled or fringed. Lettuce varieties with red foliage add interest and extra nutrition to your salads. Red Sails is a variety that is easy to grow and does not become bitter until the heat of summer. You can plant other vegetables in your garden now along with greens. Root crops such as rutabaga, radish, carrot and beet thrive in cool weather. Shallots, onions and garlic should also be planted now. Garlic and onions will need to grow until May in order to produce bulbs. Of course, green onions and shallots can be harvested all winter into early spring. Parsley, dill, celery, borage, cilantro and fennel are cool-season annual herbs that can be planted during the fall and grow and produce harvests through spring. Perennial herbs such oregano, thyme, sage, chives, rosemary, mint, sorrel, burnnet, lemon balm and French tarragon can also be planted now. Most of these will live and produce harvests for many years in your garden. If space in your garden is limited, grow herbs in containers. Set the containers in a sunny location close to your door so that harvesting will be more convenient.